← Do I really need that? We always get so much accomplished when we meet face to face with our designer and builder from Novell. Last evening Angelito took us through the place and showed us where work had been accomplished over the past two weeks. On the deck the lights have been installed and the torchon applied. In fact, all the torchon has been applied to the flat roof areas, too. 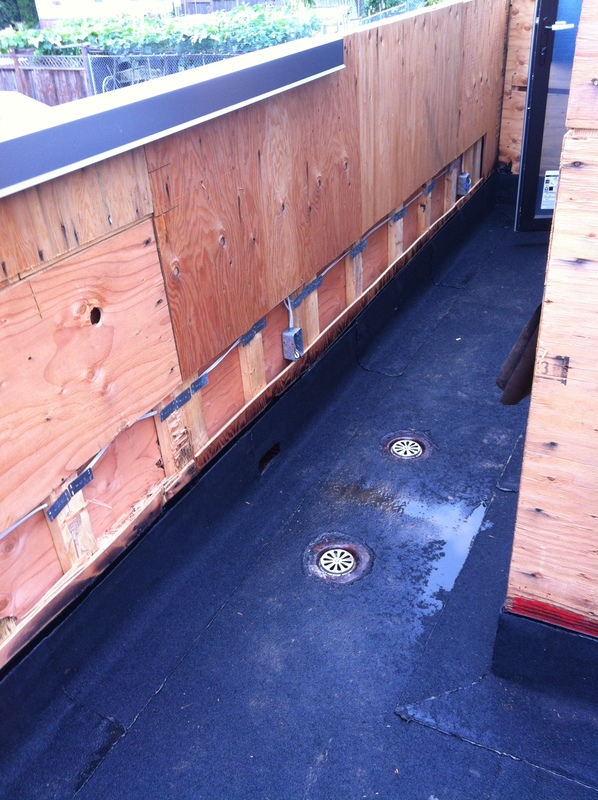 Here’s the area that will hold the living roof right off the deck. That’s a kitchen window you see to the left. We really noticed the difference inside between the roof with the torchon and without. Previously there was a small lake in our downstairs bedroom from the heavy rains we’ve been getting. Now everything inside is nice and dry. 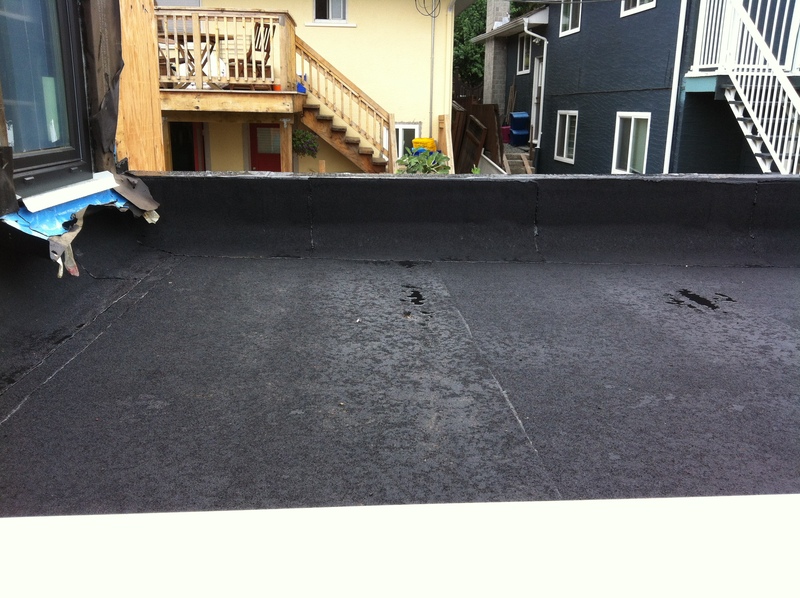 The living roof is nearly ready for us — but we are not ready for it. A few weeks of work have to be finished. Inside all the wiring is done. Plus the sprinkler system is installed. 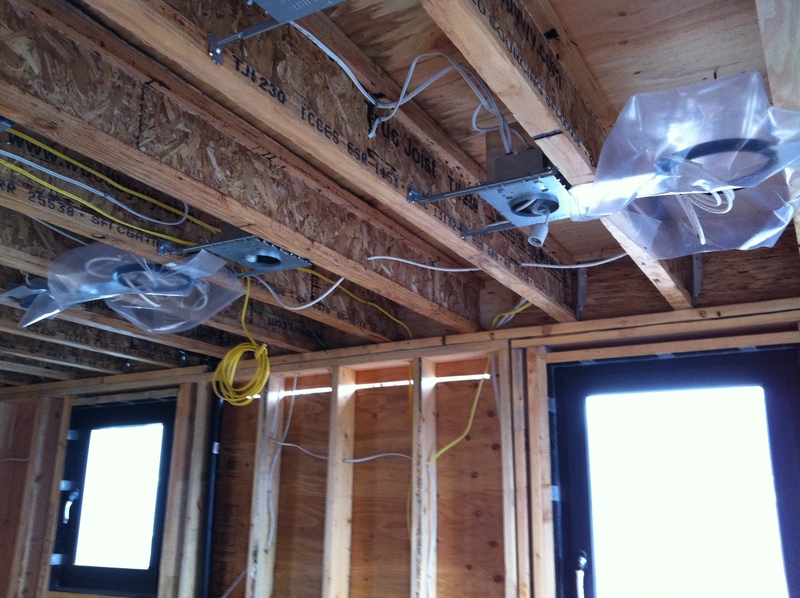 We have electrical wiring for the lights, low voltage wiring for the AV (with speakers in the ceiling), and more low voltage wiring for the alarm system. It’s going to be so good to have all this hidden behind the drywall. 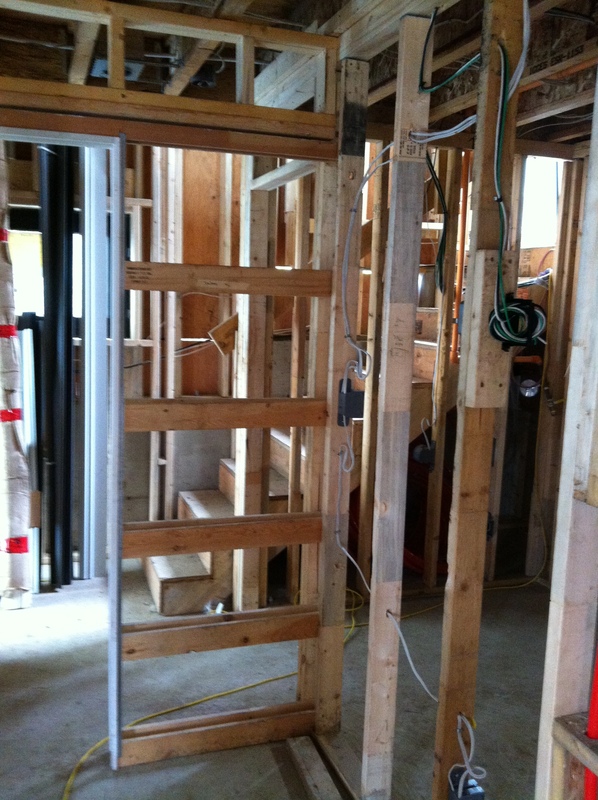 Downstairs we see where the pocket door is going to go to close off the closet and bathroom from the hallway. I’ll have my own private dressing area! Then we sat down with Laurel to talk about finishes. It’s surprising how much there was to discuss when we have narrowed down the choices already. The cabinet finish (walnut, with the grain on the horizontal), the floor (a grey-brown engineered floor), and the trim (very plain, baseboards only, no crown trim). We chatted a bit about the paint colours. And we chose the tiles for the bathroom. Two by two grey-brown for the floor, two by six white subway tiles for the shower and white hexagonal tiles for the shower floor and niche. We did talk about putting in larger tiles on the floor, but we love the non-slip aspect of the smaller ones, especially since we will be aging in place and safety is a big consideration. We also talked about the window covering. This is going to be tricky because the windows go right to the ceiling, plus they open to the inside, so we may be going in a totally different direction than we had thought. What’s next? Well the sheathing inspector just wants to see a letter from the engineers about the torchon (we think he is being extra picky about the living roof, a reasonable consideration) and then he’ll sign off. The water has to be connected before the drywall is put on, but I talked to the city last week (didn’t contact the Mayor’s office as had been suggested, just the Engineering office) and they were pretty sure the water and sewer would be connected early next week. 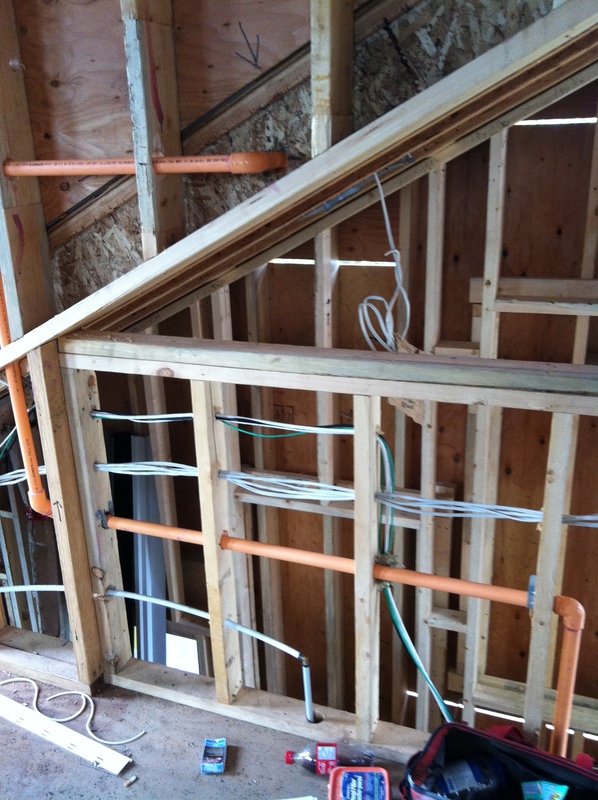 Then there will be insulation (a combination of spray foam and batting). Then the drywall! What a difference that will make. Everything is on track for the millwork, and the lights are on order. A great meeting and we continue to be thrilled and excited! Posted in Laneway House, Small House and tagged Decor, Lane Home, Lane house, Laneway House, Small Style, Vancouver. Bookmark the permalink.